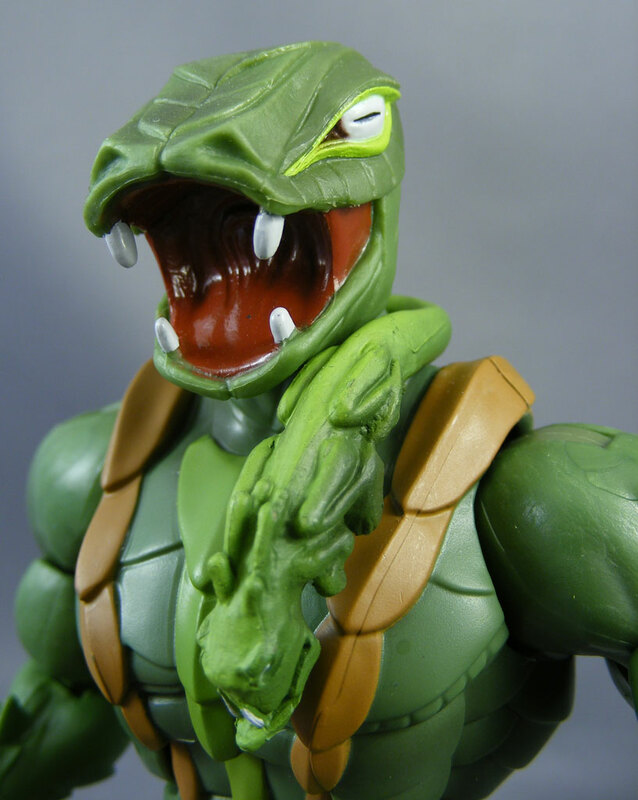 What many childhood fans of Masters of the Universe remember about Kobra Khan is that when his vintage figure was produced in 1984, he was just another one of Skeletor’s Evil Warriors (specifically the “Evil Master of Snakes”). 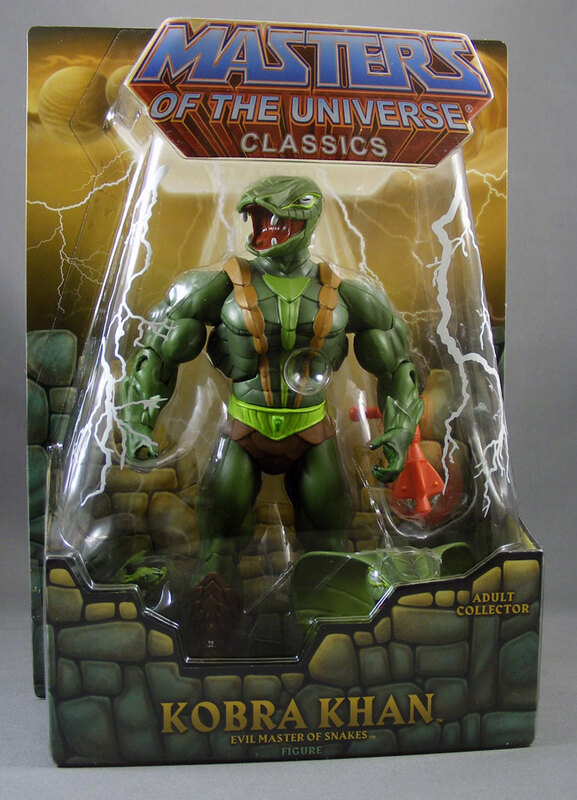 Legend has it that when the Snake Men were introduced two years later, Kobra Khan was re-released in Snake Men packaging with a new tag of “Evil Snake Men Henchmen”; however, I have not been able to track down a photo of Khan in Snake Men packaging, so I’m a bit skeptical it exists. 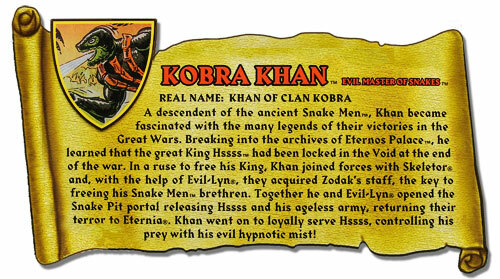 The various media depictions of Khan often address the Evil Warrior/Snake Men question. The Snake Men hadn’t been introduced by the time the 1980s cartoon ended, so Khan was merely one of Skeletor’s lackeys, albeit a fairly intelligent one; but Khan worked as a spy for Skeletor among the Snake Men in the vintage minicomics (“King of the Snake Men”). In the Millennium cartoon, he was a descendant of the Snake Men who joined up with Skeletor so he could delve into Snake Mountain and free his ancestors from the Void (“Snake Pit”). It’s notable that in both cartoon depictions, Khan had a cobra hood not present on his toy version. However, the Four Horsemen added it to his Millennium figure. Packaging: I was going to skip the packaging until I discovered this review was so short, I needed to pad it out a bit to make sure the photos lined up with the end of the review. So yeah – it’s the usual MOTUC packaging. Chances are you’ve made up your mind whether you like it or not by now, so nothing I can say here is going to change your mind. Design & Sculpt: Kobra Khan’s two heads, torso, pelvis, and calves are all new tooling. 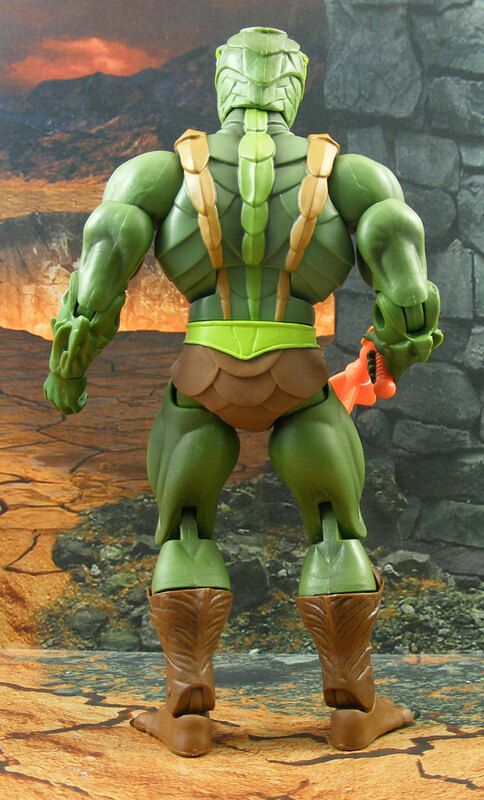 As usual with Masters of the Universe Classics, the Horsemen have primarily used Khan’s vintage figure as their inspiration. The heads are sculpted with open mouths to evoke the water-squirting action feature of the original figure. Unfortunately, unlike the Millennium figure, the jaw isn’t articulated, which would have been a very nice touch here. 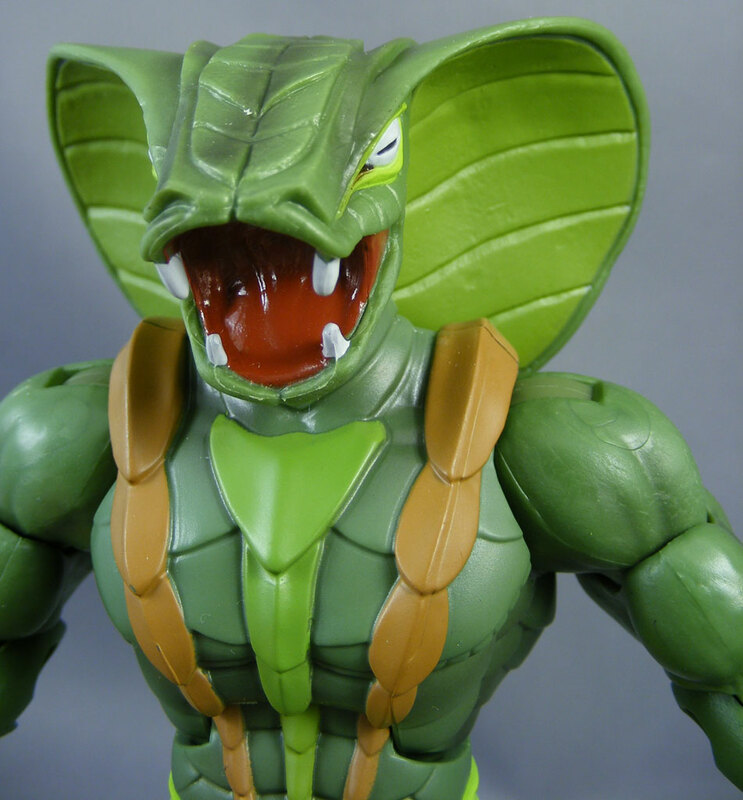 As with King Hssss‘s snake form, the fangs are disappointingly rounded. What I found most interesting was the somewhat feathery texture of the calves/boots. They’re reminiscent of modern depictions of dinosaurs with bird-like feet. Plastic & Paint: Kobra Khan is molded primarily in dark green, but the paint apps, while few, are well done here. They’re sharp, with very little bleed, and there’s a nice wash on both heads. If anything disappoints, it’s the very thick red on the inside of the mouth. 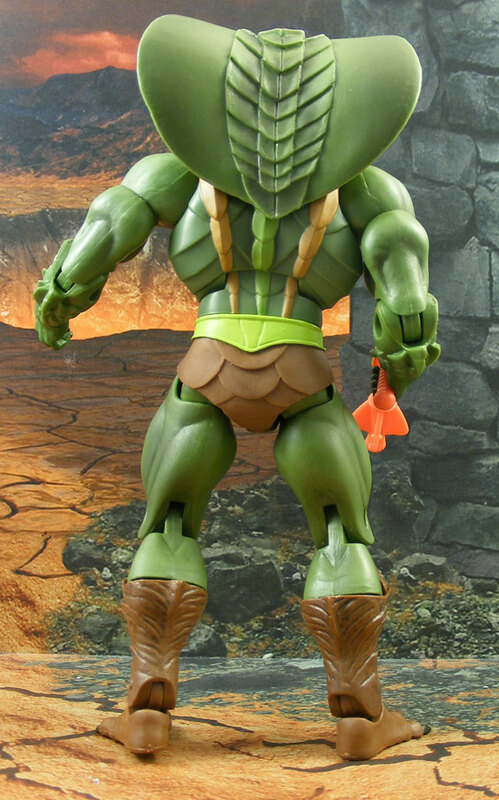 Articulation: Kobra Khan features the standard MOTUC articulation: ball joints at the neck, shoulders, and hips; swivels at the waist, wrists, biceps, top of the thighs, and top of the boots; and hinges at the abdomen, elbows, knees, and ankles. The “rocker” ankles work well on Khan. The neck articulation on the hooded portrait is obviously fairly restricted. Accessories: Kobra Khan comes with two interchangeable heads, a pistol, and his pet lizard Fang. This is one of the rare cases where I like both heads equally. I’ll probably be switching among them frequently, depending on my mood. Fang was Khan’s constant companion in the Millennium cartoon, although I’m not sure if he was ever explicitly given a name (I got it from his Mattycollector info page). It’s therefore a bit annoying that Fang can’t be placed on Khan when the hooded head is attached. Moreover, even when placed on the vintage head, Fang doesn’t really cling tenaciously so much as rest on Khan’s neck. Finally there’s the gun, which surprisingly is not just a repaint of Zodac’s gun. The barrel is different, despite the fact that Zodac’s gun wasn’t designed with the barrel as a separate piece. It seems to be based on a bit more on the Millennium version of the gun. Quality Control: No problems, unless his shoulders are backwards and I didn’t notice or something. 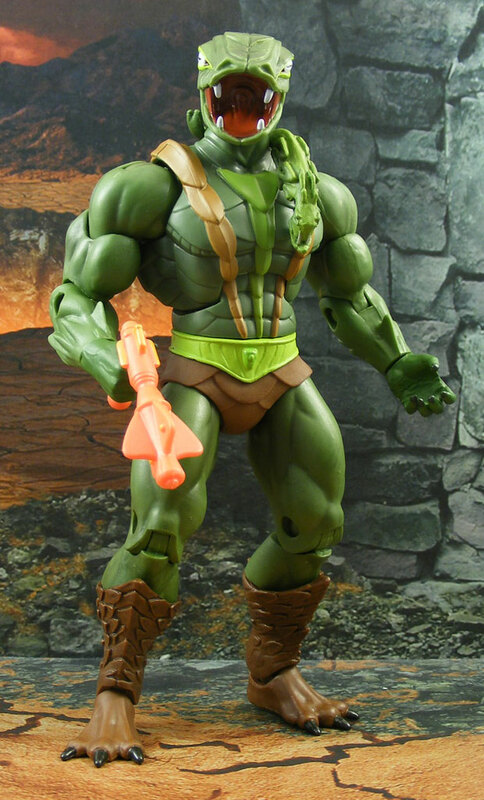 Overall: Any MOTUC figure that comes with alternate heads is automatically a better-than-average figure in my book. Kobra Khan is a classic MOTU character and his figure does a good job of offering something for fans of his various depictions. Good review, Poe! You got this one out really fast! Did you have any problems with the elbows on your Khan? Mine (and it sounds like others on He-man.org) has major issues with elbow articulation. His elbows can hardly stay extended or bend at a 90 degree angle. They almost just kind of sit somewhere in between. Weird, and I'm not really sure why. Second point: I actually stuck Pixel/ Fang on my Khan w/ the hooded head, and he fits really well. I tuck Pixel/ Fang's tail between Khan's back and the hood and he stay's on nice and secure. Mattel really did a good job on Khan. The fact that they included a 2nd gun for him, rather than just reusing Zodac's, was really a nice touch. I just bought a carded King Hiss from the original MOTU toyline and Kobra Khan is shown on the cross-sell on the back of the packaging. Doesn't this lend credence to him at least being re-released at that time? Great review, thanks. I didn't know that he wasn't part of the original Snake Man pack. Michael Crawford had some of the worst paint I've ever seen on a MOTUC figure, outside of Megator, but your Kobra Khan looks pretty well done, the eyes are a bit spotty but I think that is more due to the severity of the color choices than actual problems with the paint applications. Well, at least they didn't try to make up something really stupid, like "REAL NAME: SSWS'K'KZINTCH." Weird. Usually I get my subs really quickly (I live like an hour south of the shipping facility). I just realized this guy hadn’t arrived yet and for some reason he’s now in Nevada. Kobra Khan was my first MotU figure as a child. I'd been waiting for this one since the classics line started. He's great, even with the elbow thing. Wow, I've lost so much interest in this line, that I can't even remember if I got Khan yet. He might be in my bedroom, car truck, office drawer, or stolen. I honestly have no idea. I did notice there was some weirdness about the elbows, but I have to admit I didn't really examine it too closely. They seemed to have all the movement I needed, but I'll take a closer look at it tonight. 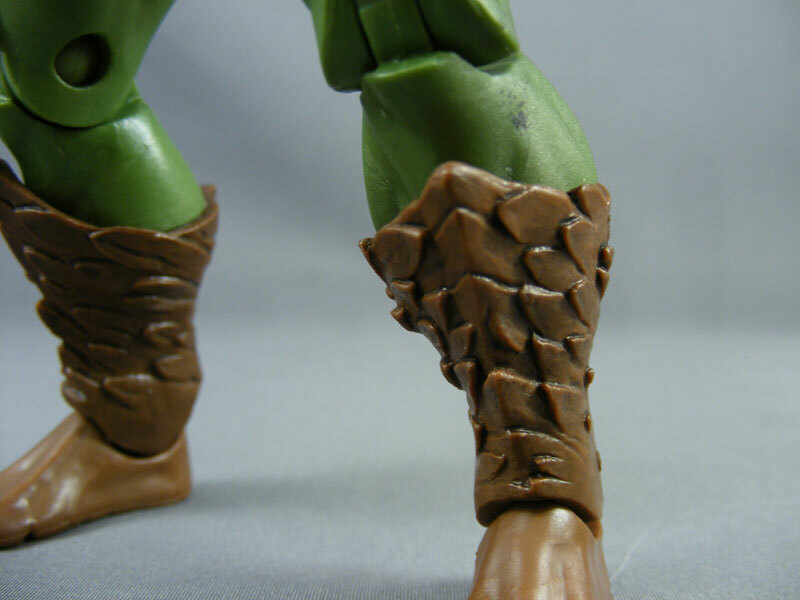 I bet those lower calf pieces are going to be reused on one of the other characters that are a "Feathered Warrior". I would love to see those used as parts to make a rebuild of "Claw Atttack" Stratos which was the third and last version of Stratos released in the 200X line. He had some small costume changes and actullly had a weapon and this would be a great way to get him and maybe give some fan an unglued set of wings in the "Red Wings/Blue Jetpack" color scheme.